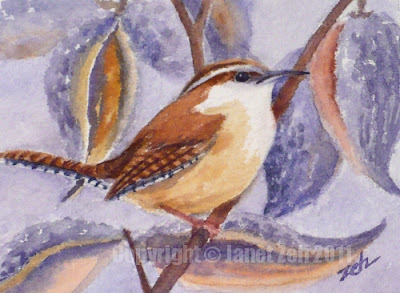 Milkweed pods make a perfect background for this Carolina Wren in winter. I had plucked a stem of these dried pods on one of my walks where I found it growing by the side of the road and was looking for a way to incorporate them into a painting. 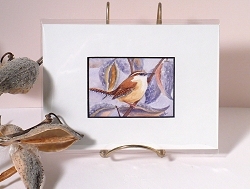 Their colors work great with this little bird. Thanks for stopping by today and I hope you have a fabulous day!